Membership is available to everyone and becoming a member could not be easier. New member applications are welcome at any time of the year. ​Our membership fees represent great value for money; for example, a couple (non-playing) with 2 children under the age of 10 who choose to play cricket during the summer and football during the winter would pay a total annual fee of the equivalent of 91p per day. This would allow the family to have unlimited access to the clubhouse and our superb bar and excellent restaurant throughout the year and enable their children to play sport all year round - great value indeed!! 1. Membership Base Fee - this is payable by all members and is split into 3 categories , namely Family (2 adults and all their children under the age of 18); Single Adult and Single Person under the age of 18. A £10 Late Fee on our published Membership Base Fee will apply if you are late in paying the full subscription on application or (where applicable) by the renewal date at 15th January or 15th May, however we do have an option to pay by standing order over 6 months. ​The £10 Late Fee does not apply to any new members joining after May 15th or at any time during the membership year. The Membership Fees are set annually at the Annual General Meeting of the Club which is held by the 31st March each year. Click here to view the current fee levels. The AGM is open to all voting members of the Club. For existing Members renewal notices are sent out 1 month prior to the renewal date each year. All renewal subscriptions are due to be paid by the 15th January (Football & related parties) or 15th May annually (Bowling, Cricket and other Non-playing members). To apply for membership simply download, print off and complete the Membership Form (see below) and return it to our Subscriptions Secretary Gill McElnea. The return address details are on the form. ​We also provide an option to pay your annual membership fee monthly via Direct Debit this allows members to spread their payments across the seasons. All you have to do is indicate on the form which option you are using - add in your payment - and make sure you include your email address. Your email address will be used to link you with the Direct Debit set up which will be sent to you. ​Once you have fully paid your membership fees, your membership card (s) will be ready for pick up from the bar usually in about one week. All members should ask at the bar for their cards and sign for them as it is your proof of membership and also once loaded can be used to pay for purchases at the bar where you will receive your 10% discount. ​Available for download below at bottom of page. 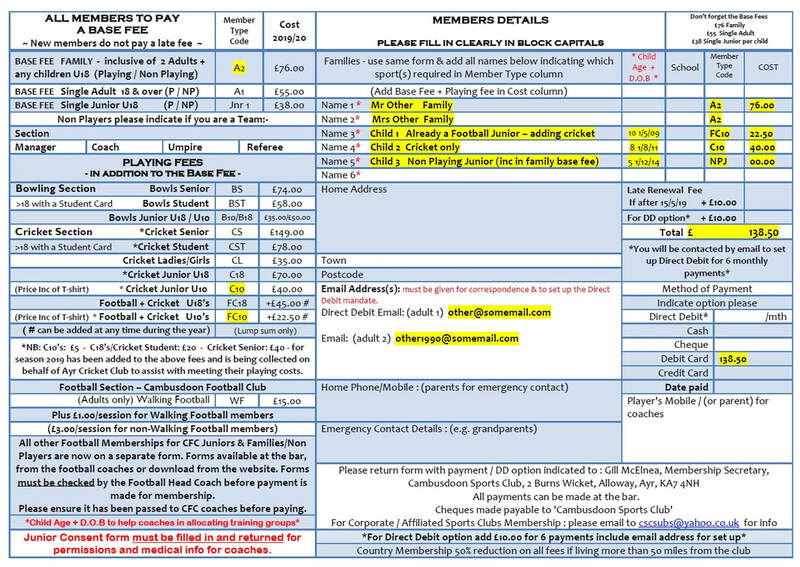 Please download, print out, fill in the forms and return them to the club for payment. ​please contact Gill McElnea - cscsubs@yahoo.co.uk.